After a long tour inside the Tower of London (see London day 15 – part 1), we had a little time to have a quick lunch. Coincidentally, Subway restaurant was the closest restaurant we could find. Even then, at 1 pm, there were lots of people (local & tourists) lining up to have lunch too! We ate quickly since we didn’t want to miss the train to Warner Bros studio for our Harry Potter studio tour! For Harry Potter fans who are planning to visit London, Warner Bros. studio tour is highly recommended!!! This is the actual studio where they filmed the movie! But manage your time wisely as it is located outside London! Do book your ticket WAY WAY WAYYYY in ADVANCE as the ticket sells out so fast!!! Especially if you only have couple days in UK! The studio only designated certain amount of visitor each day. It also has different time slots that you can choose. In my opinion, this is very useful to prevent overcrowding inside the studio. After all, you do want to enjoy the tour and too many people won’t allow you to take good picture, right?! Go to Warner Bros. Studio Tour London website to book the ticket. As for now, this is the ONLY way to purchase the tour ticket! You can NOT buy the ticket on-site!!!! The ticket is £29 for adult and £21.50 for child 5-15 years. You can also buy ticket combo with souvenir guide as souvenirs. Do consider your time for the visit since the studio is NOT in London, but it’s at Watford Junction, 20 minutes south of London by express train (or 1 hour by regular train). There are many alternatives to go to the WB Studio: by car, by rail, and by special tour bus from central London (it costs £57 including the attraction ticket). 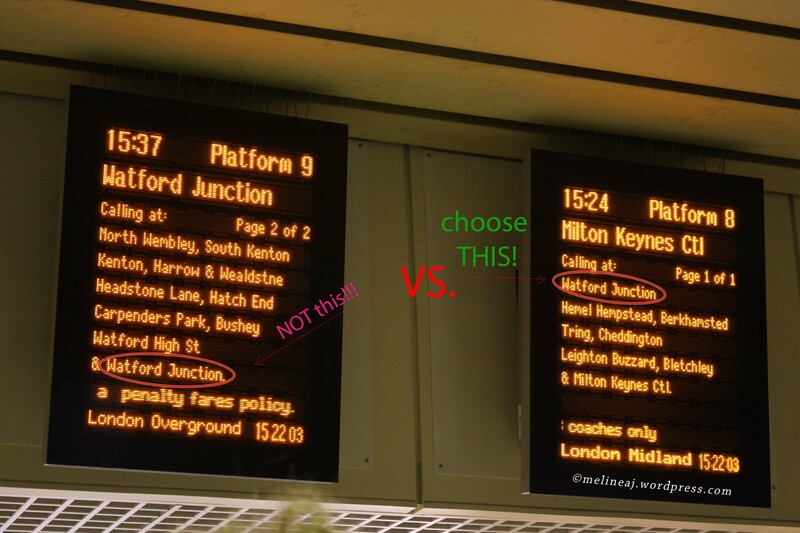 RIGHT monitor is the schedule for EXPRESS train (20 mins to Watford Junction) → CHOOSE THIS!!! Watford Junction train station; The shuttle bus to WB; The Harry Potter WB Studio Tour!!! How long should I spend the time for the tour? EVERYTHING about Harry Potter. The props, the hair & make-up, the Great Hall, the Gryffindor common room, the Dumbledore office, the Diagon Alley, the Butterbeer (! ), the Privet Drive, the original clothing used in the movie, the Quidditch, the real Hogwarts Castle!!!! Ah… I can go on and on and on and on!!! hahaha…. Oh don’t forget the Studio Shop where you can buy the replica wand, robes, every-flavor jelly beans, and every merchandise you probably want to buy (but you’ll have to restrain yourself since they are freakishly expensive!). Let’s start our tour, shall we! The shuttle bus took about 15 minutes to drive us from Watford Junction to the location of WB Studio. We passed through residential area with cute English houses and finally, I could see the yellow WB studio from afar! I had a HUGE smile on me face! *British accent* lol… We arrived at the studio at about 4 pm (the website recommends that you arrive 20 minutes early before your scheduled time). Before entering the studio, we picked up our real tickets on the right side of the main entrance. You can either scanned your printed confirmation on the machine or go to the ticket booth to exchange the ticket. 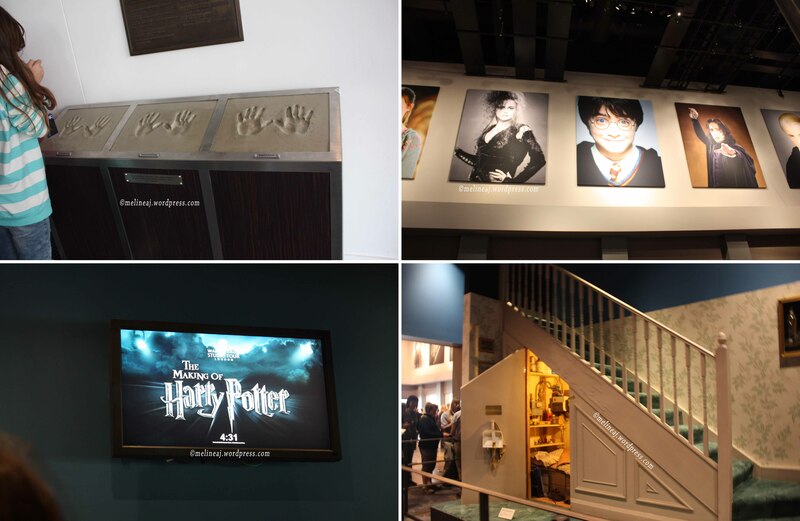 As we walked into the building, we saw handprints of Danielle Radcliffe, Emma Watson, and Rupert Grint in the entrance hallway. Entering the lobby, we could see pictures of HP characters hanging around the wall. Since it was almost 4.30pm, we lined up to enter the studio tour entrance. Lots of kids with their parents were there and got super excited. Many of them were really into HP by wearing the HP robe, glasses, and holding the wands. The line up seemed forever for me although it was just for 15 minutes hahaaha… They only allowed several people (about 20-30) to enter the room at once. While we were on the line, we saw the real HP room on Privet Drive that is a small room under the staircase. Finally, we entered the small room with a big screen at the front. First, we saw a little clip from HP casts welcoming the visitors to the studio tour (no photo & video allowed during the mini clip!). Then, the WB staffs gave some overview of the tour and called some kids who were celebrating their birthday to come up. At the end, the staffs asked the kids to wave the wand and VOILA! the screen lifted up and there was the door to the GREAT HALL! It was just MAGICAL! Even my husband thought it was a very cool and clever idea to start the tour 🙂 The tour actually starts inside studio J and continues to studio K. Do you realize that this is a subtle homage to the author, J. K. Rowling?! We were rushed into the Great Hall so the next batch of people could enter the small room. So yeah, I didn’t have a chance to take picture of the front door of the Great Hall. This is the REAL Great Hall used in the filming of HP. If you curious about the floating candles on the ceiling, don’t be puzzled. They’re not on the ceiling. In fact, the ceiling was just an unfinished studio ceiling and the floating candles are computer generated images (the poster said that they used real candles at first and decided to switch to CGI ones later due to the hazard of melting candles). Moving along, there are 2 long tables along the left and right side of the room. There were plates and cups on them, just like in the movie. If you really want to take picture sitting on the long table, go to the very front of the room near the teachers head table. On the right side, they set a shorter version of the table but if you get good angle for the picture, it looked as if you’re sitting on one long table! Along the wall, they displayed different uniforms from 4 houses: Gryffindor, Slytherin, Hufflepuff, and Ravenclaw. The windows, the dragon holding the lantern, and the brick looked very realistic. At the very end of the room, there was the teachers head table. 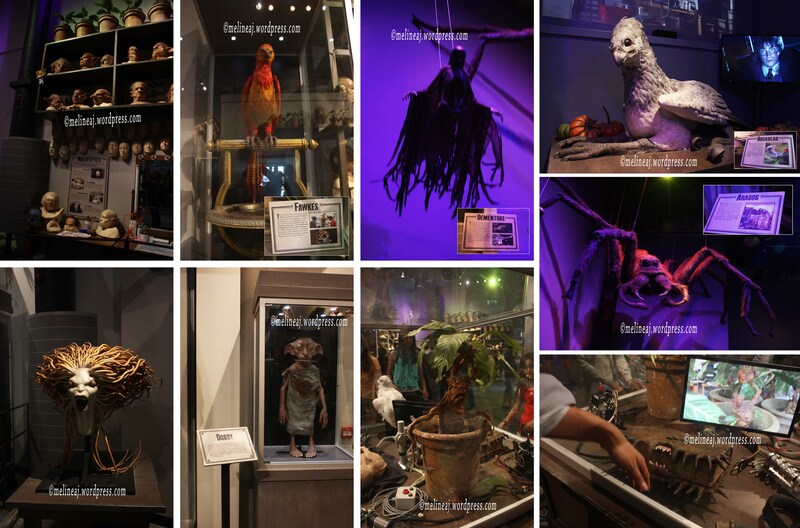 They displayed the costumes of the the Hogwarts professors and employee, such as Filch, Hagrid, Snape, Dumbledore with its Owl Lecturn, McGonagall, Trelawney, Moody, and Flitwick. After spending enough time to take picture, we move along to the left side of the Great Hall into the props tour. The tour staffs told us to look up when we walked out from the Great Hall and I did. There was a golden snitch hanging above the path! On this section, they put pictures of author, director, and producers against a big tapestry. They also has a miniature of Great Hall ceiling used in the movie. Moving along, they display the replica of chocolate feast and yule ball sculpture. Next,we saw the hair & make up section. Across this, there is a big cauldron, The Leaky Cauldron, that is the entrance to Diagon Alley. Nearby, the Hogwarts Gate stands with 2 winged boar at the top. Deep further into the studio, we saw the Gryffindor boys’ dormitory. There are 3 beds on display. The far left with plaid shirt on the bed was RW’s (Ron Weasley) and the far right with HP initial on the luggage was Harry Potter. Nearby, there’s Mirror of Erised, the mirror that can show you whatever you want, from HP and the Philosopher’s Stone movie. Next is the Gryffindor common room where Harry, Ron & Hermoine gathered to study – or to discuss how to stop Voldemort. The fireplace in this common room looked so solid because of its grey chunky stones material look-a-like. 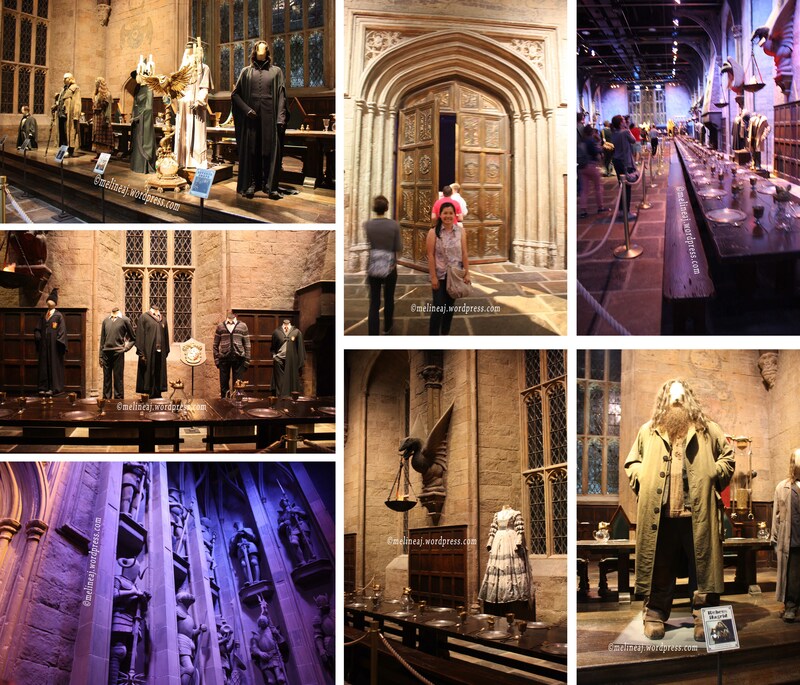 They also display Harry, Ron & Hermoine costumes that they wore during casual time. The tapestry and pictures in the room were made as if they were from the ancient time. Next to the common room, the invisible cloak with green lining is displayed on Harry figures. At the middle of the hallway, there was a caged area where they kept smaller props from the movie. 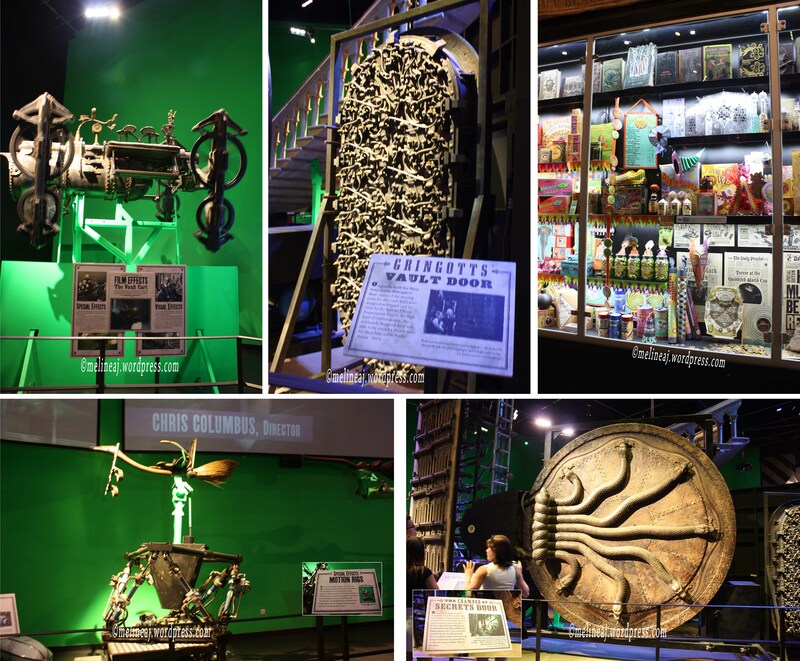 Along the cage, they display the important props, such as the circle of wands from all HP characters, the Hocruxes, Golden Egg & Triwizard Cup, etc. Dumbledore’s office is next. In the real life, his office looked small compared to the one in the movie. They display Dumbledore’s robe as well as his desk, books, and other ancient wizard tools in the rack surrounding the office. Don’t forget to take picture of the Pheonix statue guarding Dumbledore office right outside. Nearby, the window from the Clock Tower swung its big pendulum. Again, I was speechless by the details that the props crew put into this beautiful structure. Walking around the room, we saw the Potion Classroom. The dungeon-look classroom has racks with apothecary jars containing different ‘magical’ stuffs. According to the poster nearby, the prop crews used toys to fill the jars but it looked very fake in the movie. Hence, the crews brought the REAL animals, body parts, and plants! At the end, they did look old, antique, and gross! hahaha… The cauldron, small vials, and even the wooden table give mysterious ambiance to the classroom. Next to the classroom was the Hagrid’s Hut. Visitors can’t enter the hut but you can take picture around. Don’t forget to take picture of Fang (Hagrid’s dog) guarding the hut at the front door. The ‘girliest’ office and the brightest one must have been Professor Umbridge’s office with the Kitten Plates hang at the back. The wall, chair, carpet, and light are all PINK! Another movie set in the studio was the Burrow, Weasley’s family house complete with the costumes of Mrs. Molly Weasley, Ginny, and the twins, Fred & George. If you look closely, you’ll see Weasley’s clock that shows where each family member is. At the back of studio J, they display the bigger props, such as the Gringotts vault door and the Chamber of Secret door. The green screen section display the vehicles used in the movie, such as the Gringotts cart, Hagrid’s bike, and the flying broom! The large projector screen hang on top shows how they converted the green screen scene into flying action. There was a small room near this area and a long line up. Yup! 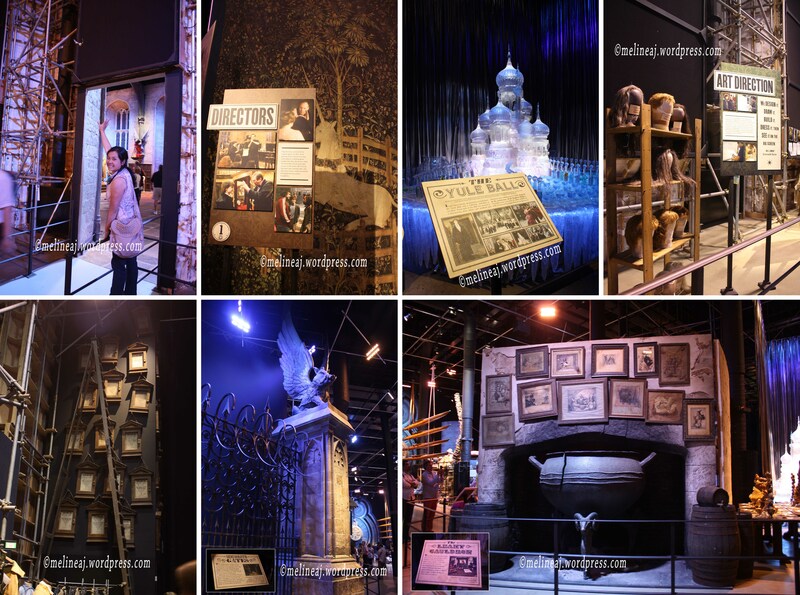 It was the time for us to have an experience being in the HP movie! They divided several booths with green screen in which visitor will be incorporated into HP flying car scene and/or flying broom scene. The flying car scene fits several people. This might be a good souvenir for a family trip. The flying broom scene is for one person. They also have some props, such as the scarf and robe for the visitors 🙂 No photo & video are allowed in this room since you can purchase the final photo & video result at the end of the tour (at the gift shop). After we finished filming in the green screen section, we explored more sections in the studio. Nearby, there was the statue of British Ministry of Magic and the emerald fireplaces to enter the headquarter. There were also the costumes of Death Eaters and the Voldemort’s robe. Before leaving the first part of the tour (studio J), there is a case full of colourful candies boxes, posters, and books from the design department. From the old looking newspaper to colourful candy boxes, they are just awesome! Kudos to the graphic design team! Exiting studio J, there was a shaded area for eating. This was a good area to rest our leg after 2 hours of walking and admiring the set in studio J. There are food stall and the famous Butterbeer stall! Most people went straight to buy the Butterbeer. After all, the visit to Harry Potter world won’t be complete without sipping to the popular wizard drink! The Butterbeer itself is NON-alcoholic. They also sells the Butterbeer plastic mug and Butterbeer plastic glass. I only want to try the Butterbeer, so I just bought the beverage in regular plastic cup for £2.95. When I watched the server prepared my drink, I noticed that they actually used Starbucks syrup as its ingredient. So, finally time to taste…. Butterbeer was very sweet soda with caramel & butterscotch taste. The proper Butterbeer serves with foam at the top (so you can make a foam moustache with it hahaha). My hubby didn’t like it since it was overly sweet. But I like it (yes… I have sweet tooth!). At this area, there were also the purple triple-decked Knight Bus, Sirius Black’s motorcycle with the side car that Hagrid used to pick up Harry, and the light blue flying Ford Anglia that Ron drove in Chamber of Secrets movie. They also set the wooden Hogwarts Bridge in the middle of the area. Here, we walked along the bridge and took pictures as if we were in the HP movie. Don’t forget to walk to the very back of the area. There are aunt Petunia & uncle Vernon’s house, #4 Privet Drive, and the Potter’s Cottage in Godric’s Hollow with the hole on the roof. These houses are for display only, no visitor can enter the houses. Before entering the 2nd part of the tour, studio K, they put the complete chess pieces from HP and the Philosopher’s Stone movie. The display was the original sculptures that can be moved with remote control and even explode. Cool! We spent a good half hour before continuing our tour to the next studio. Entering studio K, they showed more awesome props, like the masks and lots of full figured characters, such as Fawkes, Dementor, Buckbeak, and Aragog. In the middle of the room, there is a glass case with Mandrake, The Monster book of Monsters, and curled down Dobby. Apparently, they have sensors that detect movement. Whenever we were close to the case, the book run closer to bite you and the mandrake popped up and screamed at us. It was super cool! At the other side of the room, they display the full wax figures of the characters, such as Dobby, Harry, Ron, Hermoine, etc. The next section of the tour was the Diagon Alley!!! 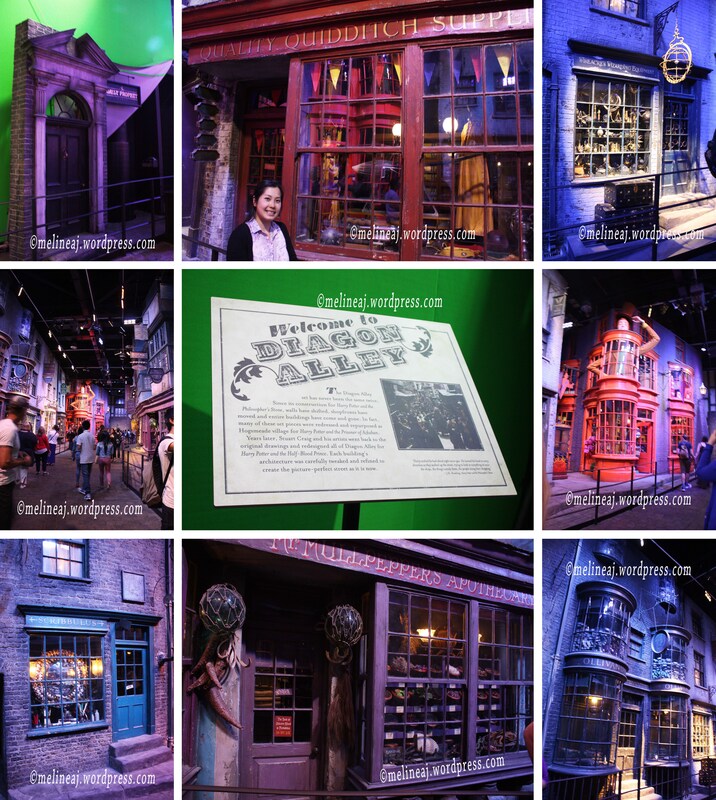 The rows of wizarding shops were just fantastic!!! There were Daily Prophet, Quidditch Supplies shop, Wiseacre’s Wizard Equipment (if you’re looking for a magic telescope 😛 ), Weasley’s Wizard Wheezes candy shops, Ollivander’s Wand shop, Mr. Mulpepper’s Apothecary, and Scribulus flying broom shop. I just can’t believe this short alley was the actual place where they filmed the movie. 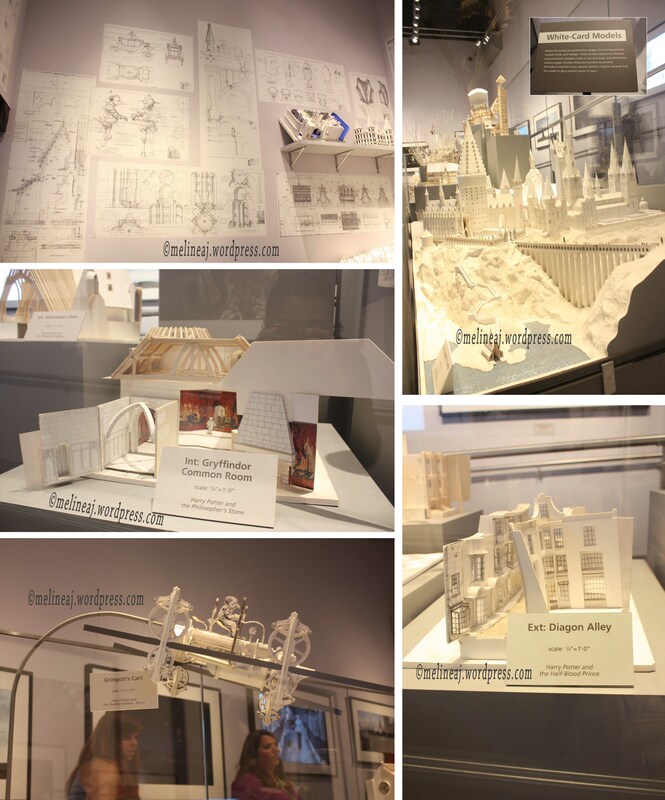 Right after the Diagon Alley, we walked through a ‘white room.’ There were lots of sketches and paper model displayed in this room. If you are a graphic designer, this must be an eye candy for you! Most of the characeters and structures’ sketches were blown up and hung on the wall. In the centre of the room, there were glass cases containing the actual scale down paper model for Hogwarts castle, Diagon Alley, and even the Gringotts cart! The next section, the real Hogwarts Castle, left me speechless! Entering this dark room, the Castle looked so magical with the light effect changing from day to night. This huge model is the REAL castle they used in the movie. 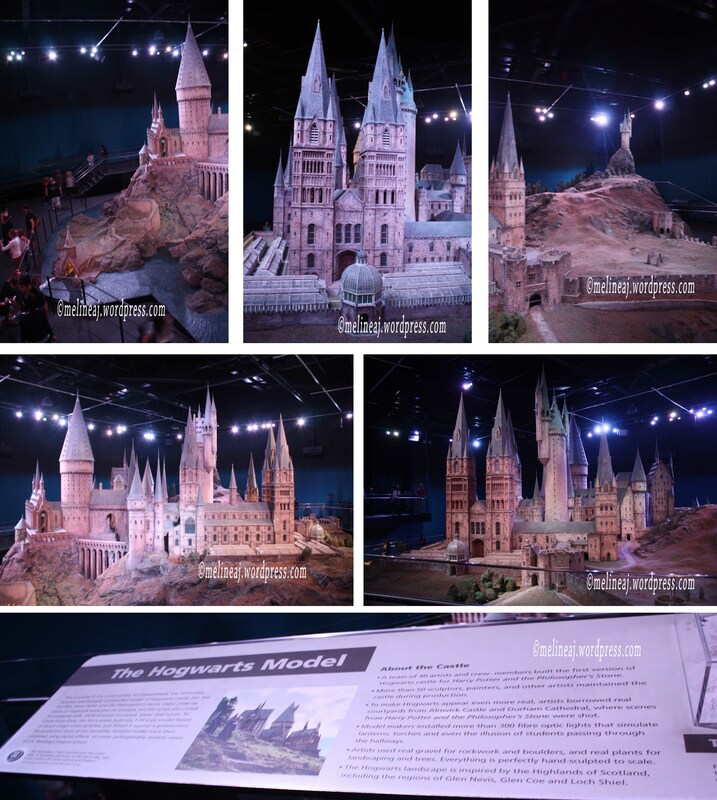 HP movie was filmed in real Alnwich Castle but the far shot of the castle shown in the movie was from this model. Around this main display, there were touch screen monitors showing how the crews built the Castle from the ground up. They also give a lot of fun facts about the castle. As I said before, the room has a light effect that changing from day (bright) to night (dimmed). From our experience, if you want to take good pictures of the castle, be patient and take a quick shot whenever the light turns bright. Ollivanders Wand Shop – the end of the tour nooooooo…. Well… don’t be so sad leaving the studio, there is a gift shop at the very end. First thing we did was reviewing our ‘act’ in HP scene. Yeah… we are amateur hahaha… We didn’t buy our photo & video since it was a bit pricy for us *although I wanted too. * Anyway, me and my husband had a lot of fun while acting on the flying broom hehehe…. 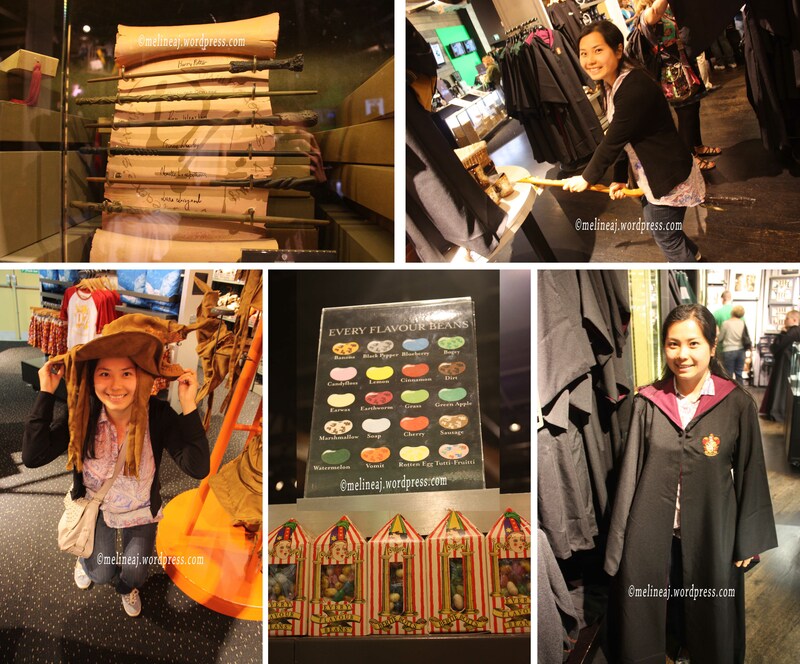 As in many tourist area, the merchandise are pretty expensive – after all, it’s Harry Potter brand! There are common souvenirs with Harry Potter’s logo, such as T-shirts, hoodies, shot glass, pencil, etc. If you really want to have a piece of HP, you can buy the replica wand! Yes, they sell wand from every HP character, including Voldermort’s. If you feel more like ‘flying’, you can buy the flying broom. Or if you curious which house are you belong to, you can get the Sorting Hat *no… it didn’t tell me which house I should be in since it was just a grumpy-looking hat ahahaha…. * If you want to prank your friend, the every-flavour jelly beans are available too! 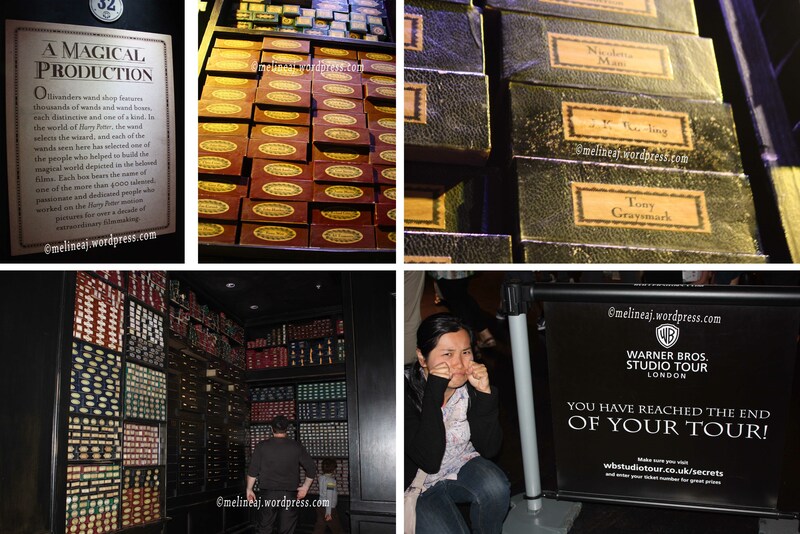 With flavor selection of vomit, rotten egg, and earwax, be careful to eat one yourself hahaha… I was tempted to buy the HP’s wand – actually I like Volemort’s wand better – but I know this kind of souvenir will be just collecting dust in my drawer. At the end, me and my husband decided to buy a matching Harry Potter’s Quidditch shirt (I think it was about £50 each). What I strongly suggest is to HAVE fun! Be a kid again – even though you’re an adult hehehe…. Have a MAGICAL day that you’ll remember for the rest of your life! If you want to see another Harry Potter filming location around London, go to Rick Steven’s Europe website or Travel Britain website. Most of my references for HP stuffs are from Harry Potter wiki website. 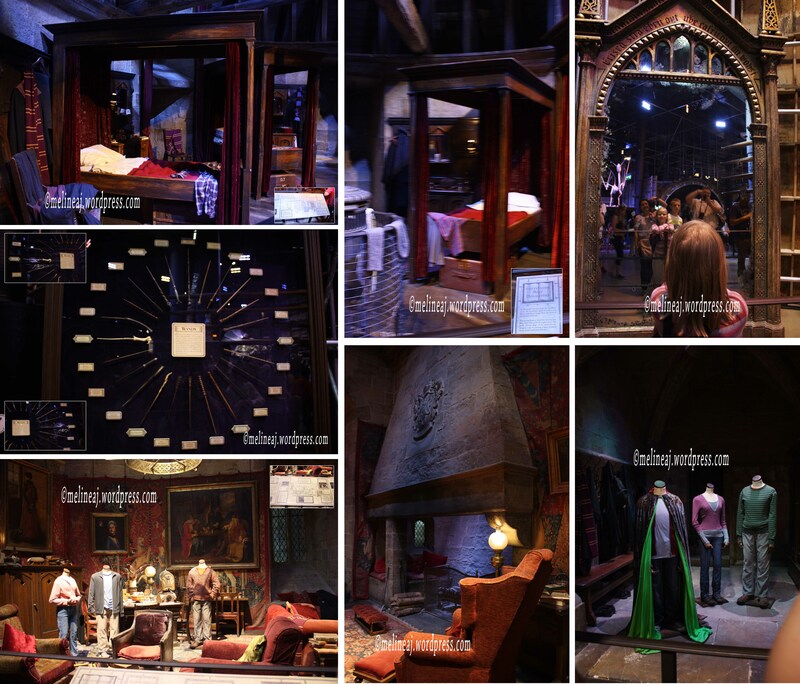 2 Responses to "London day 15 – part 2 (Harry Potter Warner Bros. 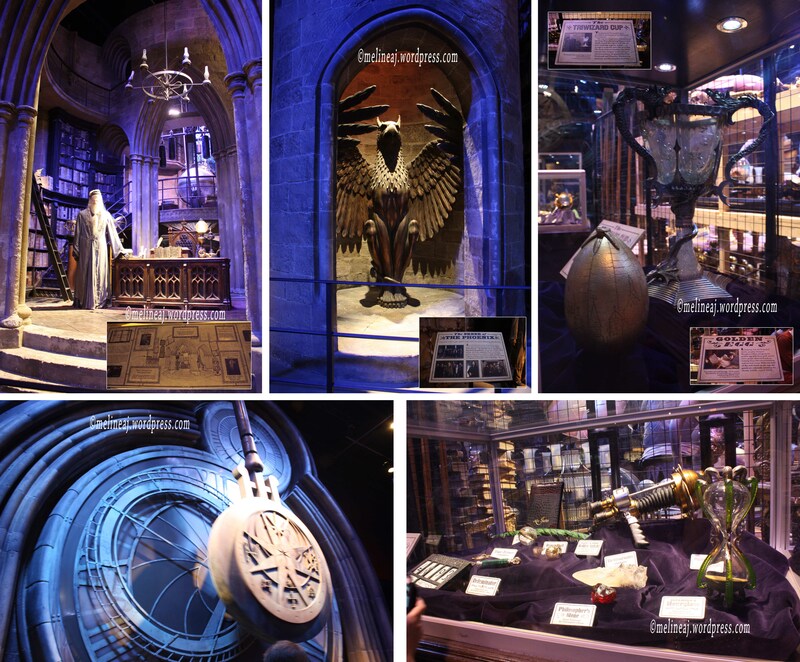 Studio Tour London)"